Have you ever visited somewhere and it just gets into your soul? Someplace you dream about going back to over and over? For me that place is New Orleans. Last October my mother and I went to the Big Easy to celebrate her 60th birthday. A few months later I wen back for a work conference. There's no third trip scheduled (yet) but I just can't shake it. The music. The people. The articheture. The food! All of it. So to help me stay connected to the city that stole my heart I try and make Creole and Cajun food as often as possible - from seafood chowder to red beans and rice. I love it all. 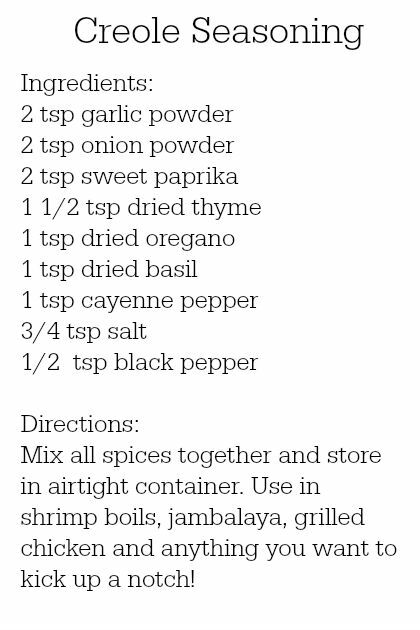 And being that everything is better homemade I found a recipe for a Creole Seasoning that can be used for everything! It's great. I mixed it up and bottled it and now I have a little bit of NOLA right in my cupboard.